Everything happens for a reason they say, and our path to finding our home was no exception. We spent the last few weeks trying to find the 5th wheel toyhauler that was just right for us. No matter which one we looked at, nothing felt right. Either Mitch kinda liked it and I didn’t or I kinda liked it and he didn’t. 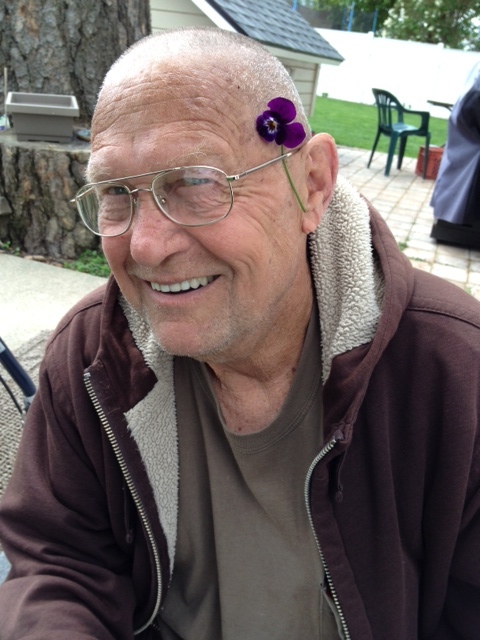 Papa being his easy going self was supportive of whatever. Finally, we found one that we all thought could work for us and we made an offer, but they wouldn’t go down in price and no deal was made. That night we were so perplexed about things not working out. I was frustrated with the idea of paying a large amount of money for something that didn’t have the things we were looking for, and just settling. It was to the point that if we had to settle we would just get a darn camper and make it work. At that moment in the conversation, when Mitch mentioned a camper a lightbulb shinned a spotlight onto the answer to our prayers. Go a different way, if plan A didn’t work, plan B isn’t right, go to plan C, get a camper and a travel trailer! We thanked God for the deal not working with the 5th wheel and experienced a surge of renewed excitement and confidence. This is our path! Papa can live in the camper and the dogs and us can live in the travel trailer!! The best of both worlds. Now dad can nap at noon, go to bed at 7:30 and wake up at 4:30. We won’t have to tip toe around each others sleeping habits, still have two bathrooms, it costs less and we can have our own space! Yippeee! It seemed as if the options would be endless when we decide this new direction. Until we started looking. 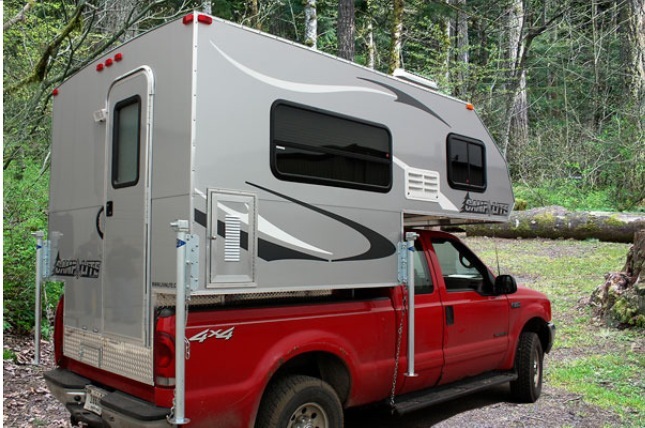 There were things to take into consideration, the weight, having a short bed truck, and towing the trailer with the camper on the truck. Finding a camper was more challenging than expected but in a few days we knew exactly what we wanted. None were to be found within a 200 mile radius, the closest one was apache camping in Everett. Don made the process simple, emailed us a purchase order and is holding the camper for us. We will be picking it up on July 30th. It’s a livinlite camplite camper. It’s made of all aluminum and weighs 1670 lbs, plus it matches the truck and won’t hang over the bed. Onto our trailer… We looked at every dealership at least twice, and a couple we began to know the layout better than those that worked there. Still nothing that met our needs. Again, would we have to settle? Then last week on craigslist we saw one that had a few of the things we wanted from a private seller and figured why not check it out. We didn’t have our hopes too high when we went and looked, but it was everything we wanted and more! It has great closet space, kitchen counter space, plenty of cupboards, storage and the best part, wait for it…. Two bathroom sinks!! Who would have thought that we would finally get our two sinks in a travel trailer. 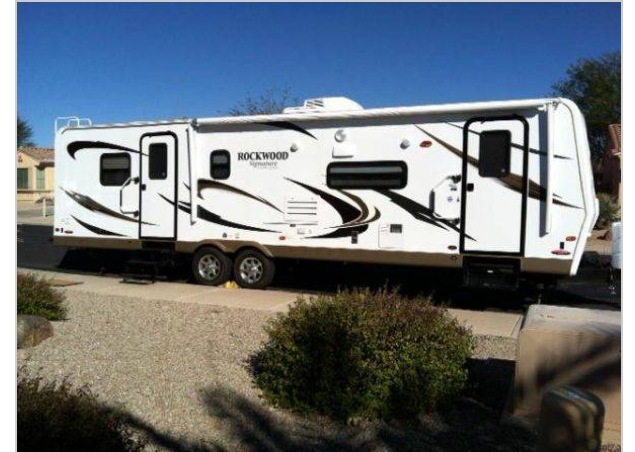 It’s a 2012 Rockwood signature ultra lite 32 ft. Excellent condition, and great colors for the interior. the search is finally over. The couple we bought it from are wonderful people, they are going to give us a complete walk through on Wednesday and since the truck is in the shop they are going to haul it out to our place afterwards. So grateful to be back on track. It’s been a long few months, with some trying times but it has all worth it. This entry was posted in Uncategorized and tagged 5th Wheel, camp lite, camper, livinlite, plan c, privacy, trailer, two bathrooms. Bookmark the permalink. Yay!!! I’m SO happy for you all! Can’t wait to see you!